Hello! It's time for another CR84FN (Create For Fun) Challenge! Thank you to all who joined us last week.. it was fun viewing all of your fabulous creations! 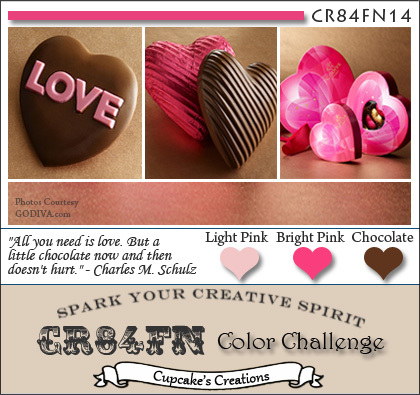 For this week's challenge (CR84FN14), our color palette is Light Pink, Bright Pink and Chocolate. This is one of my favorite color combinations.. I hope you like it too and will come play with us! Please join me in welcoming our February Guest Designer... Stella! I made this card for my niece, Evie.. it was her birthday a couple of days ago, and yes, it will be a little late getting to her, but we did get to chat for a little bit on her actual bday.. Happy, Happy Birthday, Evie! We love and miss you! To get started, I pulled out some yummy My Mind's Eye paper (from the Lost & Found Madison Avenue collection) and some My Favorite Things goodies, and this is what I came up with. I am addicted to just love these sweet Pure Innocence stamps. This one is called Birthday Princess. I added a little lace and tied my tag on with some variegated Chocolate Latte Dream String. Accessories: Petite Oval and Labels Ten Nestabilities, Tags Trio (Spellbinders); Die-namics Scalloped and Scalloped Scallop (My Favorite Things), Chocolate Latte Dream String, Pink rhinestones (Pizzazz Apenty); Lace (Kaisercraft), Foam tape, Thread, Sewing machine. She's such a cutie!! I like the way you've paper pieced her dress. Eivie will love this card - it's very special! Gorgeous card, such a sweet image beautifully paper pieced. Love the scallopped layers and lacy trim. I love (am addicted) to those sweet images too! 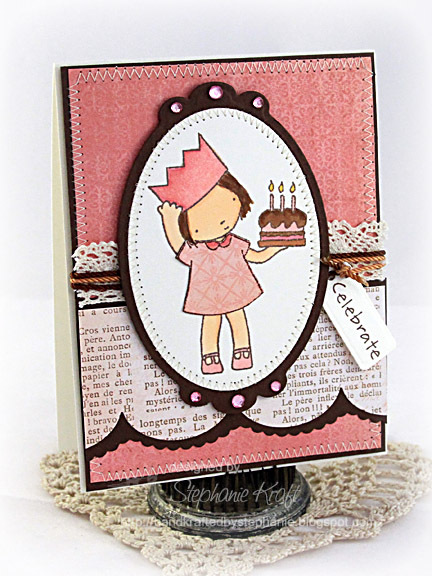 Gorgeous card and she is adorable in her pink party frock! Wonderful use of the sketch. Stephanie, Birthday Princess, how PERFECT is THAT for your niece! Even if this card is belated, she will truly cherish it's cuteness! Also LOVE the text border and the bling - sure to be loved by any birthday princess! You are fabulous with coloring did you know that? That little cutie and the cake; so adorable. Your card is gorgeous! Stephanie, I know I sound like a broken record, but this card is sooo beautiful!!!! The sweet image, the lace, the stitching, the bling - just GORGEOUS!!! WOW!!! What a sweet little image and I LOVE what you've done to make it even more so -- all the little details are just sweet perfection!!! 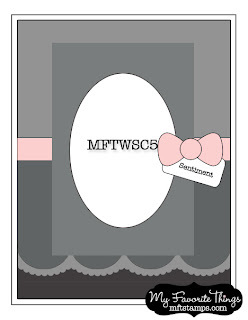 Such a sweet image to use for your niece's BD card. Fab use of this weeks colors along with the sketch! Oh Stepahnie, your card is beautiful...Love he colors and of course the sweet image! I am never usually into this kind of image, but I have seen this little lady a lot in the past couple of weeks, and she's really adorable! I love how you paper pieced her dress, and I love your background DP - the two papers work so well together! !